I'm trying to decide if I've even tried 250 different wines in my lifetime. I'm leaning towards no. But coming up next week is an opportunity to do just that. Clearly you won't make it through all of them (unless you spit), I'm pretty sure death would come first. But, at least you'll know you have a lot to choose from. All the details are on the flyer above. 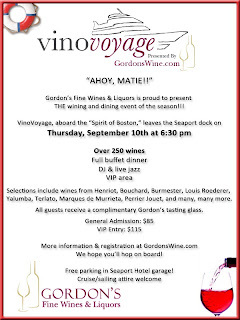 Dinner + Jazz + Wine + Being on a Boat = awesomeness. Looks like it's time I dug out my flippy floppies and my nautical themed pashmina afghan. Click (here) for more info or to sign up. 0 Response to "250 Wine VinoVoyage Tasting - 9/10"